Plyned is a sleek model design great for coffee tables, end tables, dining tables and desks in many sizes. Made completely from bamboo, the edges offer a layered surface in juxtaposition to the top. The Plyned is made from bamboo, a very sustainable wood with a beautiful grain. The finish options are rich and contemporary. With clean lines of the minimalist aesthetic, it works well with Viesso’s line of sofas and chairs. Typically this model takes 3 weeks before it is ready to ship. Viesso has built a line of furniture and home accessories with great respect for the planet in mind and a focus on beautiful design and functionality. All their products are custom so there is little to no waste. They don't have large inventories of products like most companies, because they don't build it until a customer orders it. This makes their manufacturing process very efficient and reduces their impact on the environment in terms of materials used. They offer products that are made from natural, recycled, and sustainable materials and are manufactured via reduced emissions. Available in Amber, Coffee, and Natural finishes. The base material for all Viesso’s exposed wood products including beds, tables and desks is bamboo plywood. Bamboo is considered a grass and from an environmental standpoint, this is important because is grows so quickly. Unlike traditional hardwoods, bamboo does not require replanting. Mature bamboo has an extensive root system that continues to send up new shoots without any outside manipulation. The natural grain on the bamboo highlights the eco-friendly stains that they apply to it, and its durability as a wood creates a piece that will last. The process used to create the plywood is called a "hot process", where they heat and attach the layers of bamboo to each other. Some formaldehyde is used for structural integrity, but the amount is below E1 European standards which are stricter than the US standards. Any off-gasing occurs when the wood is being made, not at the time it is used for one of their products. 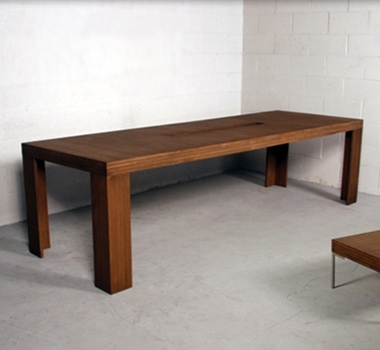 Viesso uses water-based glues on their upholstered and exposed wood products. Water-based adhesives emit far less VOC's (Volatile Organic compounds) than their conventional solvent based counterparts. An adhesive that offers low to zero VOCs will be less toxic less odorous, and less flammable. They use stains and finishes on their exposed wood pieces that are solvent-free and contain no biocides or preservatives, only aliphatic low-odor mineral spirits for less toxic results. Made with polyx oil, they’re engineered with plant oils and waxes. The clear coat sealants they use are water-based, non-hazardous and non-flammable. Allow 3 weeks for production in addition to shipping.